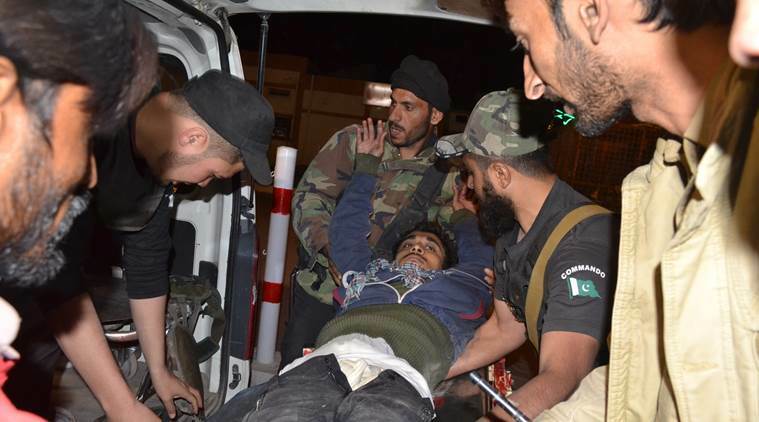 Image Credits: http://indianexpress.com || Pakistani volunteers and police officers rush an injured person to a hospital in Quetta, Pakistan, Monday, Oct. 24, 2016, after two separate attacks in Pakistan. Gunmen stormed a police training center in the restive southwestern province of Baluchistan Monday, leaving several people wounded, hours after another attack near to Quetta leaving two customs officers dead, authorities said. Gunmen stormed a police training center late Monday in Pakistan’s restive Baluchistan province and detonated explosive vests, killing at least 48 police trainees, authorities said. Baluchistan’s top health official, Noorul Haq, said at least 116 people were wounded mostly police trainees and some paramilitary troops. A security official put the death toll at 51. He spoke on condition of anonymity because he was not authorized to speak to media. Major General Sher Afgan, chief of the paramilitary Frontier Corps, told reporters Tuesday that the attackers appeared to be in contact with handlers in Afghanistan. He said the attackers belonged to the banned Lashker-e-Jhangvi Al-Almi group, an Islamic militant group affiliated with al-Qaida. Neither Lashker-e-Jhangvi nor any other group has claimed responsibility for the attack. But the Islamic State group and breakaway Taliban faction Jamaat-ul Ahrar have claimed responsibility for past attacks in Baluchistan. Lashker-e-Jhangvi has mainly targeted members of minority Shiite sect of Muslims. The attack started when between four and six gunmen opened fire as they rushed the hostel at the police training center in a suburban area of the provincial capital of Quetta. “They were rushing toward our building firing shots so we rushed for safety toward the roof and jumped down in the back to save our lives,” one of the police trainees told Geo television. Security was tight Tuesday morning around the training center and hospitals. Haq, the top health official, said many of the trainees were killed when the gunmen detonated explosive vests. He said the death toll was expected to climb as many of the injured were in critical condition. General Afgan said most of the deaths happened when two attackers exploded their suicide vests. “This is an open war and when you have enemy inside and outside, they can easily exploit the situation,” said Afgan. He said the security forces and police were clearing the area and searching for any possible hidden attackers. Baluchistan has been the scene of a low-intensity insurgency by Baluch separatist groups for more than a decade. Islamic militants also have a presence in the province that borders Afghanistan. The provincial home minister, Sarfaraz Bugti, said one attacker was killed by security forces and two died when they detonated their explosive vests. He said that about 700 trainees were at the base when it was attacked. Baluchistan police chief Ahsan Mahboob told reporters that four gunmen attacked the training center, attempting to enter the hostel housing the trainees. A gun battle erupted when the guards resisted, he said. A statement issued by the military put the number of attackers at up to six. Footage shot by local television showed ambulances rushing out of the main entrance of the training center as fire engines rushed to put out fires set off when the gunmen threw incendiary devices. Most of those being treated at city hospitals had gunshot wounds, although some sustained injuries jumping off the roof of the hostel and climbing a wall to escape the gunmen. Nearly all of the wounded were police, authorities said. Local television reported that two explosions were heard, but it was not immediately clear what caused them. Violence is common in the province, and the attack came hours after gunmen shot and killed two customs officers and wounded a third near the town of Surab, about 90 miles (145 kilometers) south of Quetta. Earlier Monday, two gunmen on a motorcycle killed a police intelligence officer in the country’s northwestern Khyber Pakhtunkhwa province, said Khalid Khan, a local police officer. The Pakistani Taliban claimed responsibility for that attack. The group’s spokesman, Muhammad Khurasani, said in a statement that the shooters returned to their hideout after the attack. Pakistan has carried out military operations against militants in tribal areas near Afghanistan and in cities across Pakistan, but extremists are still capable of staging regular attacks.